This page includes news, coming events, community information and other NDNCC items of interest. Welcome to Corinne Dries, our new ECE Program Director!! NDNCC is so excited to have Corinne join our team. She comes to us with many years of education and experience in the Early Care and Education Field, and has already taken a leadership role in the center. She has energized the whole team to continue to grow and be the best they can be! NDNCC, in conjunction with Deerfield Fine Wines, is hosting a winter wine tasting event. Enjoy a selection of wine, beer, spirits and appetizers from 5 – 8pm. A raffle drawing will be held, and 15% of all sales that night will benefit NDNCC! Please join us for a fun evening out. Tickets are $20, or $30 for a couple, and are available here. Please join us at 6:00 pm for dinner, staff recognitions, NDNCC 2018 accomplishments and free family entertainment! Capital Improvements on the Way! NDNCC offers it sincere thank you to the Crystal Trust and the Crestlea and Chichester duPont Foundations for their generous contributions to our center for capital improvements. Energy saving work has already begun, and in the next few months look for the interior of the center to undergo fresh new painting. Also a new sidewalk along our entry drive will provide for safer pedestrian entry to our facility and traffic calming measures will be added to our parking areas. In the spring we plan to undergo landscape work in the front of the building. All of these projects are making 2019 an exciting time to be here. Summer Camp at NDNCC is a great place to be. Campers are busy with many outdoor activities, arts & craft projects, swimming, and team games. Field trips are planned to places such as the Philadelphia Zoo, Hershey Park, Dutch Wonderland, Dorney Park, the Renaissance Fair, Midway Raceway and Water Park, and Rehoboth Beach/Cape Henlopen, to add even more great adventures to our themed weekly programming. On site presentations are included, and camp wraps up with a Fun Fair of carnival type games and an inflatable obstacle course. We look forward to seeing all the campers at our American Camp Assoc. accredited camp this summer!! Enrollment begins in early February, so contact Irene Bailey to get your camper enrolled! The children have been enjoying learning new skills in each of the classrooms. Winter themed activities are blossoming throughout ECE. The ECE children enjoy music lessons once a week, Toddlers and Preschool classes participate in Jump/N/Fun classes once a month, and Read Aloud Delaware volunteers spend several hours per week reading to our children. Look for family-centered activities offered in your child’s classroom throughout the year. Look for Another Garden Party in the Spring! 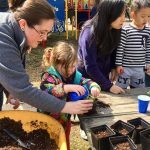 NDNCC held a Garden Party on Saturday, April 21st, and the event was a great success! 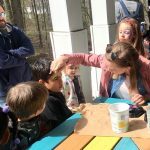 We had visitors from the Brandywine Zoo including a porcupine and a giant rabbit, and a beehive demonstration from the Entomology Department at the University of Delaware. 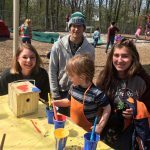 Children painted birdhouses to take home, and transplanted lavender, peppermint, and marigold seedlings for their home gardens as well. Our very own SAC teacher Mackenzie painted faces, and we had healthy drinks and snacks for all to enjoy. We raffled off two trees, a gift basket from Harvest Market, $25 gift cards from Leon’s Garden Center and Gateway Garden Center, and two $25 coupons from Home Depot. Fifty eight families joined the event, as well as several staff and board members. It was a gorgeous day, and everyone had so much fun! We plan to host another Garden party this coming spring. Our ECE Teachers complete fall, winter, and spring assessments on children enrolled in the program, using the Teaching Strategies Gold assessment tool. Ages and Stages Questionnaires (ASQ-3) are also used in the ECE program. Families complete an ASQ-3 for their child and together the teachers and families review the results to determine if children are developing at an age appropriate level. Teachers hold conference with families, reviewing the children’s progress towards research-based developmental benchmarks and goals, at least twice per school year.